My review of a newly acquired Hoka One One Stinson running shoes in Issue 2 still generates queries from club mates more than a year later, and many have taken the plunge in purchasing their own pair of cushioned heaven. After 14 months and more than 1000 miles, I thought I would update you with my relationship progress with these unique shoes. Despite showing substantial signs of wear and tear on the sole and uppers, they still feel just the same as they did a year ago. They are my go-to shoe for virtually everything, whether racing or training on trails, road or track they have never let me down. They are super stable on the rough stuff and flat road, and I am sure their down hill performance cannot be beaten by any other shoe on the market. Like me, they are not particularly useful in mud, and but non-muddy offroad runs are a joy. Despite their normal retail price of over £100s, I feel they are excellent value for money because they seem to have coped with at least double the distance of normal training shoes. I am sure that they have also helped to protect by ageing legs and body; I have noticed a definite reduction in hamstring issues which were plaguing me pre-Hoka time. My first pair of Hokas have served me well, so I have retired them after being tempted by a pair of Hoka One One Bondi 3s for a ver competitive price of £75. PS If you fancy a pair, purchase at least 1/2 size larger than normal as they tend to be a small, narrow fit. I was a skeptic, but now I am convert. After seeing Les Paul running in a pair of Hokas, I became curious and wondered if these shoes held the secret to protecting my knees. After much investigation, I decided to plump for a pair of Stinson Trails as a Christmas present. 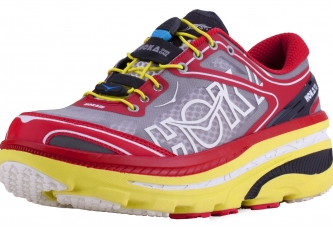 The Hoka Stinson Trail is one of an ever increasing range of trainers designed specifically for the ultra-running community (of which I am not one). The shoes include up to 2.5 times EVA of normal trainers, have 4 to 6mm drop, an in-built rocker to encourage good running style and weigh a lot lighter than they look. After 4 months heavy use, I can report that I love these shoes. I have used them for many training runs, on and off road, and even on track. I even use them in the 5K Park Runs. Their grip is superb in all but the muddiest conditions, and they encourage rapid (pain-free) descents. The feet are cradled in foam, giving complete protection from anything the ground can throw at you. Since using them, I can run more often, longer and faster(for me), and my knees and hamstrings do not bother me anywhere near as much as they used to. 1. They are not cheap, at over �100 they are investment but reviews to suggest they last much longer than normal trainers. 2. It is difficult to run in other trainers after you have become used to such luxury. 3. They are not the lightest shoe, and do not perform well in muddy conditions. If you need to save your knees, then these shoes (or others in the range) may be for you. Natasha Fellowes I love mine too. They rescued my knee. But rubbish on mud and wet grass. Joe Duckworth Been wearing Hoka's for any race longer than 10 miles now. Wouldn't wear anything else! !